I’ve done a couple of my last speeches at my Toastmasters clubs about Persistence. 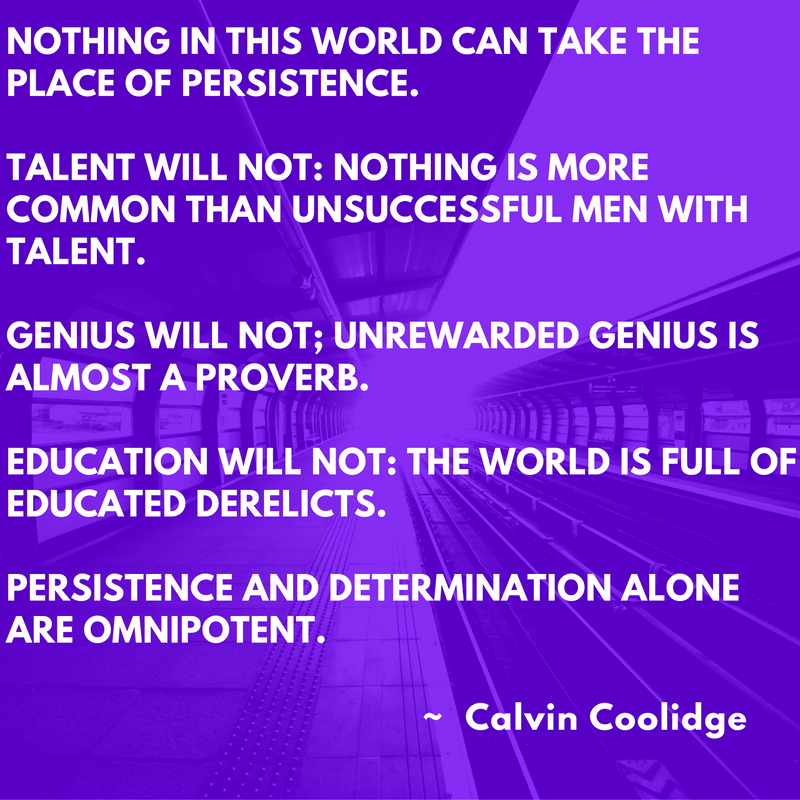 I was backup speaker at Cable Car Toastmasters one morning and our Grammarian, Mike Kress, selected the word Persistence for our Word of the Day. That triggered my mind about the a quote I had heard years ago. The quote and the thought behind it has stayed with me since I first heard it when I was a kid. No, I didn’t hear it directly from Calvin Coolidge. I have a few years on me but not that many. Mikes word choice and events going on in my own life prompted me to write the speech about my youngest daughter, Courtney. Courtney was about to graduate from College. Within the next several weeks she will earn her degree that she started in 2007. That’s 9 years ago. Today, I am recording from Manhattan, Kansas where I watched Courtney walk across the stage and receive her diploma and mover her tassel from the right to the left. She is now a college graduate with a Bachelors Degree in Animal Science. Courtney had persistence. She started in 2007 at Berry College in Rome, Georgia. In 2010, she was convinced by her then partner to transfer to K-State. She liked the school and thought it would be a good idea. The cost was less expensive as an out of state student the the tuition at Berry College in our own state. However, after moving to Kansas things took a turn for the worse and she had to move back to Georgia. I had relocated to California and Courtney was on her own in Georgia. She worked and eventually was able to get back into K-State online. Over the next 5 years, she continued to work full-time and go to school online. This week, she graduated. It took her 9 years to complete her degree, but with her persistence and determination she was able to accomplish her dream and earn her degree in Animal Science. This determination and desire are what prompted me to do speeches about Persistence and Determination. I want you to know that if you have persistence and if you know your Why you can overcome your obstacles and walls that are built in front of you. You can succeed. Your goal may have been to do it in 4 years, or 5 but it doesn’t matter how long it takes you. If you believe in the dream, if you believe in yourself, you can triumph. I was talking to the server at dinner the night before graduation and she was undergoing a similar hardship. She had moved to Manhattan to attend K-State and had encounters some obstacles and had to drop of school. She was attending Manhattan Technical College currently but wanted to go back to K-State to earn her degree in in Juvenile Oncology. She said my daughter’s story of persistence had just inspired her to continue her studies and go on to achieve her dream. Go for your goals and dreams. Don’t let adversity or obstacles stop you. It may slow you down, it may deter you for a time, but if you keep you Why in your mind, if you persist with a dogged determination, you will succeed. Go Out Today and Be Determined. Persist Past the Pain! Persistence and Determination Alone are Omnipotent! Thank you for joining us. I want to let you know that I am offering one on one coaching sessions to help you get the goals you set. Are you getting ready to set your goals for the new year? Have you had problems achieving your goals the last few years. We all need to have help sometimes. Even professional golfers hire swing, short game or other skills coaches. Let me help you set goals properly and hold you accountable. Go to my Services Page to learn more. Go out and Make it a great day.